A few weeks ago, I attended the launch of Benefit’s Brow Bar in Debenhams in Middlesbrough with Tor. If you are familiar with Middlesbrough (or Boro as its known), you will know that Debenhams Beauty Hall was tiny and cramped, and if I was in Boro shopping I’d bypass the beauty hall as a quick short cut to get from the main shopping street, into the shopping centre. However to my amazement Debenhams has totally revamped and modernised their beauty hall so it is now on par with their beauty halls in Newcastle and the Metro Centre. 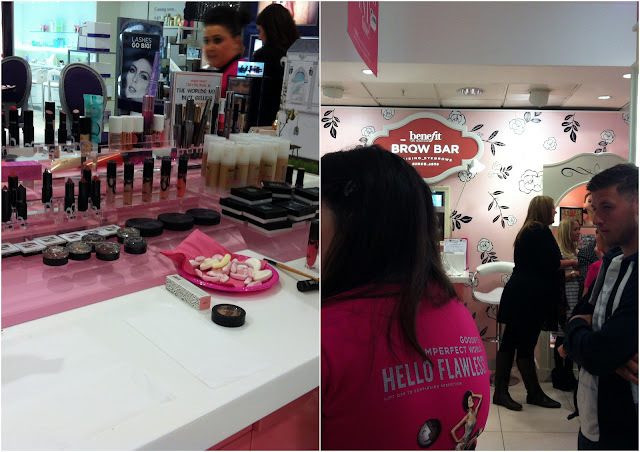 Benefit initially had a small counter in the centre of the Beauty Hall, but now they’ve expanded it and added a brow bar. Myself and Tor had a quick look around the shops beforehand as Boro Topshop is amazing- anything you see on the site and you can’t find it in Newcastle/Metro Centre- Boro will stock it, also the new Primark is fab too. I also got another piercing in my right ear (I’ll save that for another post). 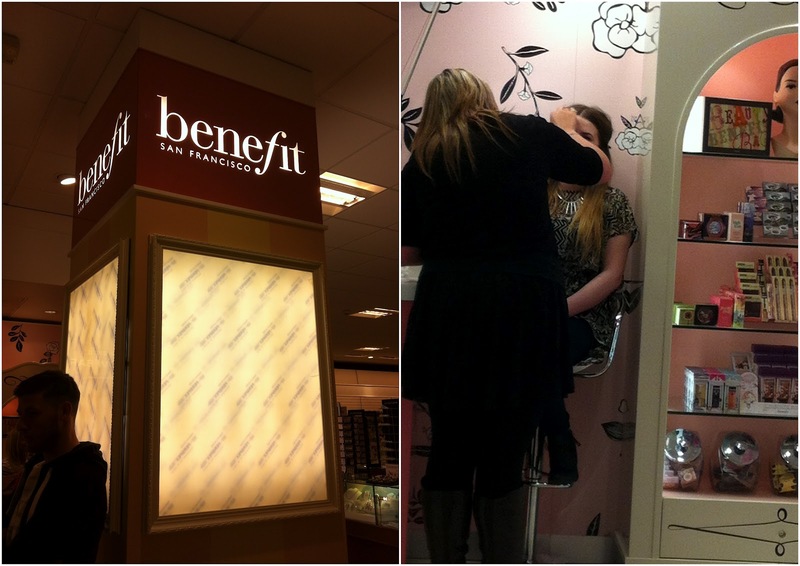 So onto the new Benefit counter (or should that be area) which you can spot a mile off- its pink, kitch and girly which to me keeps in with the look/feel of the Benefit brand. What I love about the set up is how all the products are displayed in stands/pods which I think is a fab idea- by doing this you know that say your having a consultation with a member of staff, your not going to be interrupted by customers trying to get into a product. Also by setting the products up like this, if your having a quick glance at the stand, you get a better over view of the products in their range. Even though it was the launch day, the brow bar was going mental- all the girls in Boro love their brows (Tor is a prize example of this). The lovely mua talked us through their signature “brow” which even though it follows the same principle it creates a completely unique brow shape to you. Each of the bloggers present (myself, Tor, Becky and Tiffeny) had their very own mua who each gave us a make over, before we got our brows tinted and then shaped. I think the Benefit girls were all in a state of shock when I told them why I don’t pencil my brows in after a mishap (not my doing) with their BadGirl eyeliner. If your eyebrows are like mine (very light/thin) I can’t recommend getting them tinted- I’m totally converted. My eyebrows look fuller and more defined. I’m going back next Friday to get them waxed and tinted again with Tor. I’m definitely a convert. The girls kindly provided us with some goodies to take home with us, so expect reviews on these in the near future. Massive thank you to Shell, Leanne, Rita, April and Ben (“love it”) for a fabulous afternoon. Tor and Becky have also done posts on the event too, there’s a rather embarrassing one of me on Becky’s post getting my brows waxed. I totally get what you mean about Beauty Halls being crowded! I need to look more into eye-brows I think. 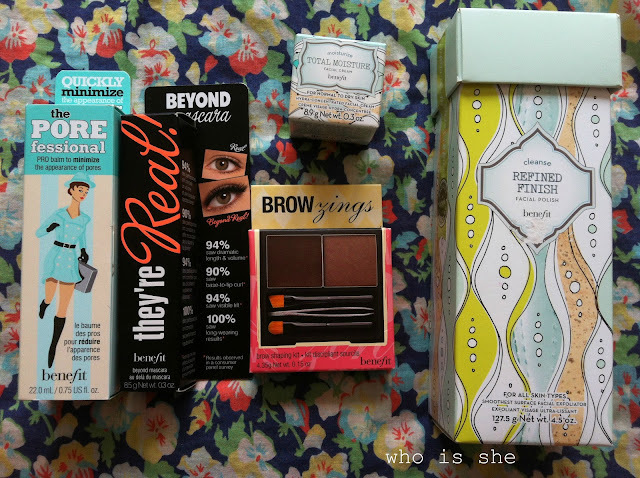 I still want to see a photo of you with the brows!